This page is intended to be a guide to the mechanics of Blood Magic. This will cover most of the main aspects of the mod, and how to progress through the tiers that it offers. The first item to make to begin on this journey of magic, is the Blood Altar. This is where Blood Infusion occurs; a process that infuses items placed in the Altar with blood in the form of Life Essence (LP for short) obtained from self-sacrifice or from mobs. It is recommended to place the altar in an area with sufficient space, as upgrading the altar through the multiple tiered structures, will involve expansion of the altar with Runes as the Player progresses on his or her quest. The Sacrificial Orb is another item needed to begin Blood Magic. The Player can use the Orb to transfer a heart of their health into the Blood Altar, filling the altar with 200 LP per heart. Keep Right-clicking while within one block of the altar with the Sacrificial Orb in hand to use it (make sure to be near enough for the transfer to take place). The altar can later be upgraded with Runes of Self-Sacrifice to get more LP per heart later on. Meanwhile keep making small sacrifices to fill the Altar with enough LP to start making the items needed to progress. By now the altar should have gained a fair amount of LP, shown by a small pool of red liquid at the bottom. With enough blood essence accumulated in the Altar to start a transmutation process, Right-click the Blood Altar with a Diamond to place it, displaying it floating above the altar since it doesn't have a GUI. To pull items out of the altar, Right-click it with an empty hand. Red particles will start dispersing from the Diamond as it slowly absorbs the essence. To complete this process, the altar will dispense 2,000 LP to the Diamond. Since a heart gives 200 LP with the basic Tier 1 altar, 10 hearts are needed to make the Player's first orb. Remember that Players regenerate health over time at the cost of hunger, so be careful of two things: the altar running out of essence, and the Player running out of health. If the altar runs out before the transmutation is completed, the altar will start to emit white particles as it slowly starts to lose progress. It is very easy for the Player to kill themselves using the Sacrificial Orb, so caution should be taken when the Player is sacrificing their own blood. Life Essence can be pumped in and out of the altar, however it is very slow. It pumps out 20 LP per second (this can be increased with one or more Rune of Dislocation). When the altar is first placed, the first 1,000 LP is placed into the altar's output buffer. Pulling Essence out of the altar will take from the buffer, and pushing it in will place it in the main tank. The Diamond's transmutation will be complete when it transforms into a Weak Blood Orb. Pull it out of the altar with a Right-click and again to bind it, this uses a heart and fills the Player's Soul Network with 200 LP. Blood Orbs are the only way to fill up a Player's soul network (either by Right-clicking with the orb or placing it in an altar that contains LP), and are an important part of crafting with Blood Magic. Never get rid of a Blood Orb, as it will always be of use. The Weak Blood Orb can craft a few basic type of Sigil, perform weak rituals, and make Runes. It also has a maximum LP storage capacity of 5,000 LP. One of the first things to make with the Blood Orb is a Divination Sigil. It needs an item called a Blank Slate. Place a piece of stone in the Altar with 1,000 LP to make a Blank Slate. Right clicking with the sigil in hand will display how much LP is in the Soul Network, or display information about the Altar, such as the tier, the maximum LP capacity, and how much LP has been collected. The other two type of Sigil that can be made with the Weak Blood Orb are the Lava Sigil and the Water Sigil. Right-clicking with those will spawn a source of its respective liquid on the ground. This action costs 100 LP for the Water and 1,000 LP for the Lava. 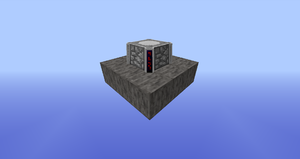 Another useful item is the Lava Crystal that allows a furnace to use LP from the Player's Soul Network as fuel (25 LP per smelt). It doesn't need to be a vanilla furnace; a Generator or Steam Dynamo will work as well, however, the Player should take caution so that their Soul Network does not run out of LP. The tier 2 upgrade structure. At this point, it is probably a good idea to start upgrading the altar. To upgrade the altar, place some Runes near it arranged into a multi-block structure. 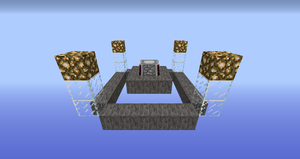 Once the altar has been upgraded to Tier 2, the Player can choose to either continue using their own blood, or use the blood of others by making a Dagger of Sacrifice and using it on any living mob near the altar, including Players. Another item to make after obtaining the Tier 2 altar is the Apprentice Blood Orb. This is an upgraded Blood Orb than can store 25,000 LP. The new orb will require infusing an emerald with 5,000 LP in a Blood Altar. With this orb, several more type of Rune and Sigil become available, such as the Rune of Self-Sacrifice and the Air Sigil. Now that the tier 2 Orb has been achieved, the Alchemy part of Blood Magic can start. Alchemy basically allows to make potions and reagents. Every potion made this way has eight uses. Strong or long lasting effect potions can be made (for example: Haste with a duration of 30:00) with combined effects. Another branch of Blood Magic now available is Spell casting. These are useful early game ranged weapons and utility items, and it is recommended to at least try them. Also available are the Air Sigil, the Void Sigil, the Sigil of the Fast Miner, and the Sigil of the Green Grove. A quick summary of their effects, respectively: Crude but fast flight, an endless empty bucket, a portable beacon effect, and a way to use blood as fertilizer. The tier 3 upgrade structure. Keep upgrading the Altar. The next orb is significantly more complex, yet the attentive Apprentice should be getting the hang of it by now. The Magician's Blood Orb requires 25,000 LP, and a Block of Gold to be made. At this point the Altar can only hold 10,000 LP, so the Altar will need to be filled as the Orb is being made. If choosing self sacrifice, potions of regeneration and instant health will be needed to keep the Player alive and going. On a server, a PLayer may want to ask for friends to help, although, sacrificing passive mobs is most likely an easier way to accomplish the task at hand. Runes such as Rune of Augmented Capacity and Rune of Sacrifice could be used. The Blood Altar needs to be upgraded to tier 3 to make the orb. This requires more Runes and some Glowstone to build. With the Magician's Blood Orb in hand, Blood Magic really opens up. Alchemy, Rituals, Bound Armor, Automation, and many other things become available. Feel free to browse this Wiki for more information. This page was last modified on 28 August 2018, at 22:39.